The ShopAbility team takes a She Said / He Said view of common retailer issues from both the shopper and retailer perspective, for Convenience World Magazine. We’ve all heard the old saying; there are two sides to every story. Well, the same can be said if we look at common retail issues from the perspective of the shopper versus the retailer. Here we will look at some typical front of house (shopper) versus back of house (retailer) issues and try to find common ground with a solution that will work for both parties. The ultimate goal for a retailer is to sell more (AWOP), to more people (traffic), more often (frequency). To do so, it helps to put yourself in the shoes of your customers (or prospective customers), think about what they see and how you could make it easier for them to shop your store. Enhancing the shopping experience for your customers will not only encourage them to spend more in an individual shopping trip but will also improve the chances of them returning to your store as the result of their previous experience. So, let’s take a look at some common shopper and retailer issues, and some possible solutions. Shopper Issue: I couldn’t find the yoghurt spoons, Slurpee straws, etc. so I left the store without buying anything. Shoppers who are purchasing food and beverages in convenience stores are looking for solutions. They have a problem they need to solve and they are looking to you to provide them with a quick, easy solution. These problems are the reasons they come to your store (e.g. “I’m hungry”, “I’m thirsty”, “I need an energy boost”). If there is an element of the solution missing (e.g. a spoon or a straw) then you are creating another problem rather than a solution. In this situation you risk losing a sale altogether. Shrinkage is an issue that retailers face on a daily basis. Small items such as straws and spoons are easy targets. Because of the disposable nature of these items some customers do not think about the fact that these items are an expense to the retailer. They therefore may not have the same level of consideration for these items as a retailer does. Saving a nominal sum of money to avoid theft of these items at the risk of losing multiple sales is crazy. Provide solutions to your shoppers, rather than more issues and make it easy for them to buy. It might be a simple calculation to quantify the value of spoons and straws but it is impossible to quantify the value of the sales you have lost over time. If theft is particularly bad in your store, clearly communicate to your customers at the point of sale (at the slurpee machine, where the yogurts are etc) that these items are available at the register. Shopper Issue: What I came in to buy isn’t there (out of stock). Shoppers get frustrated when the product they come into buy is not in stock. They have an expectation that a convenience store will have a core range of products. They don’t expect you to stock everything but they will expect a reasonable range of products in the core convenience categories. Retailer Issue: With deliveries arriving at different times of the day and days of the week, it is difficult to keep the shelves full all day, everyday. Managing inventory is core challenge of running a retail business so it is important that you get it right. Challenges such as delivery times and days and inventory holdings all need to be taken into consideration when considering store design, layout and ranging. When considering your range think about each category individually. What is the role of that category in your store and therefore what breadth and depth of range do you need to stock? If you have an issue with out of stocks, implement a system to calculate days of supply vs shelf space so that you have a better idea of how much stock you will need to order to cover you between deliveries. A product can’t sell from the store room so if you have particularly products you regularly run out of on shelf, consider deleting a slow moving line that isn’t adding value to your range and open up on facings. Shopper Issue: Once I am at the counter paying it is too late to ask me to if I want an extra packet of chips, drink, etc. I don’t want to have to go back to the shelf or fridge. Particularly in convenience stores, where shoppers just want to get in and out quickly, customers are unlikely to want to break queue, especially to spend more money. Therefore, offering them a second item for “just a few cents more” once they have already reached the counter – or have already begun their eftpos transaction – is unlikely to be as successful as communicating the offer before they reach the counter. It is much easier to sell to a customer who is already instore than it is to drive additional foot traffic into a store. Therefore, uptrading customers at the point of purchase is a good tactic to employ to drive basket size and ultimately sales. In most convenience stores, staff are unlikely to be working on the floor and therefore will not come into contact with shoppers until they reach the counter. Make it hard for them to say no to promotional offers by removing as many barriers as possible. Where possible merchandise a small selection of ‘uptrade’ products on or near the counter so the customer does not have to go too far to take advantage of any special offer. 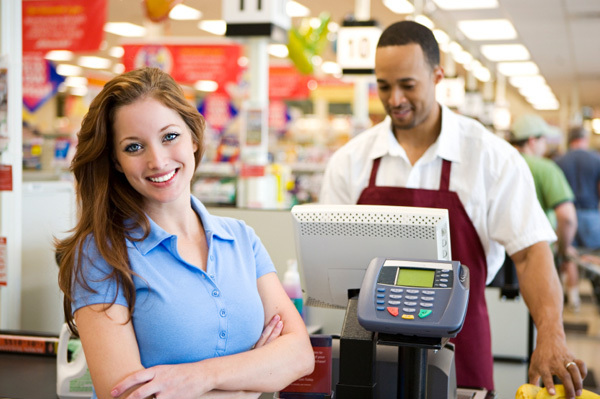 In addition, ensure that all offers are communicated effectively before the customer reaches the counter via POS or alternatively staff who are restocking shelves on the shop floor. Shopper Issue: The staff aren’t interested in serving me, they make me feel like I am interrupting them. We’ve all been in a situation where we walk into a store to make a purchase and the staff are on their mobile, chatting with other staff members or eating their lunch. It doesn’t make for a very inviting experience, does it? Shoppers in this situation feel like they are a disruption when they should feel like that member of staff is waiting to assist them and is happy to help. Retailer Issue: It is too expensive to have a manager on duty all the time to supervise junior staff members. We all know good help can be hard to find and staying focused in a retail environment on a slow day can be difficult. Finding junior staff that can maintain their level of engagement can also be difficult particularly when they are expected to operate unsupervised. Assigning roles and responsibilities will empower staff and help them take ownership of tasks within the store. When it is quiet in-store staff should take the initiative to ensure the store is well presented. Also, consider incentivising staff to make business improvement recommendations. Encouraging them to use customer feedback as a source of insight will help them realise that shoppers are a valuable source of information that may unlock business improvement opportunities for which they will be rewarded and will also encourage them to be more attentive to their needs. Shopper Issue: Prices in convenience stores are much higher than supermarkets; I might as well just go there to get what I want. In recent years supermarkets have been focused on driving the overall perception of price via deep discounting on staple grocery lines – $2 milk for example. While the primary focus of this is to secure grocery foot traffic away from its direct competitors rather than shift traffic from other retail channels, it has had a flow on affect for extremely price sensitive shoppers e.g. students who will go out of their way for the cheapest price on an item. That said, there are other shoppers who are not as price sensitive who are willing to trade price for convenience. These shoppers are higher value shoppers and have always been the core shopper base for convenience. Retailer Issue: I can’t compete with the prices offered by supermarkets. From a convenience retail perspective it is near impossible to compete on price with Coles and Woolworths on grocery staples such as 2L milk and a loaf of bread. Increasingly these retailers are trying to make themselves more available to shoppers because they understand the role of convenience. While it may feel like the major supermarkets are targeting your business and stealing your customers, the shoppers who are willing to go out of their way to get their chocolate bar or bottle of water at the lowest possible price should not be your core target. Most shoppers are willing to pay more for immediacy. If you provide them with an in store offer which is enjoyable to shop, has great service and can solve their problem quickly, most shoppers will take that over a supermarket any day. Think about how you differentiate your offer based on your site type, dial up convenience by providing solutions and make yourself a destination by understanding your core customer base. Convenience isn’t just being in the right location at the right time. It is providing the shopper with a streamlined shopping experience that helps them fulfill a need with minimal effort. To understand your shoppers, the first step is to start talking to them. Ask them about their experience, how you could improve your store, your service, your range. They may just help you to see your store from a different perspective and unlock some new opportunities.